A large group of young farmers and their family members participated in the annual summer outing that is part of KFB’s Young Farmer Program. This year’s venue was the Hopkinsville area, where the group took in a variety of sites. 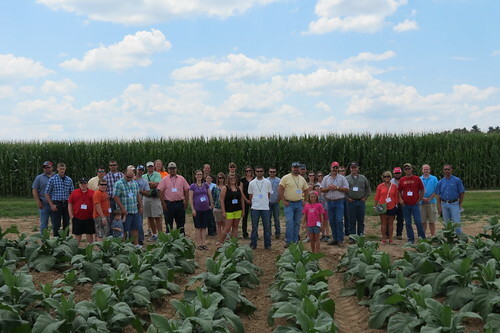 The young farmers checked out the dark fired tobacco at Cundiff Farms in Trigg County, which is growing 170 acres of the crop this year. The popular Saturday afternoon farm tours had five options. The stops included Country Barn Roadside Market, Broadbent B&B Foods, Christian Way Farm, the Breathitt Veterinary Center, Fairview Produce Auction, Consolation Farms, CommonwealthAgriEnergy ethanol plant, Hopkinsville Grain Elevator, Air-Gas Inc., Roeder Implement Company, Garnett Farms, Cundiff Farms and Hampton Meats. A kid-friendly tour went to “The Homeplace” at Land Between the Lakes. Agriculture Commissioner James Comer addressed the group at the traditional “Eggs and Issues” breakfast. He provided an update on Agriculture Department activities, including the new “Udderly Kentucky” program to promote milk from Kentucky dairy farms. Public Affairs Director Jeff Harper then outlined federal and state issues before the young farmers formed groups by districts to discuss policy recommendations. 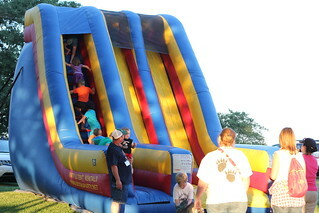 Kids enjoying the inflatables at the Saturday night dinner at Tom Folz Farm. Another highlight was a Saturday night family cookout at Tom Folz Farm. The fun-filled evening featured live music, games, children’s activities and plenty of good food. The Friday agenda included the first few rounds of the Discussion Meet, with a group of four finalists emerging from three rounds. The finalists, who will compete at the state annual meeting in December, are Casey Story of Fleming County, Janella Miller of Pulaski County, Mary Courtney of Shelby County and Cameron Edwards of Webster County. Finalists for the Outstanding Young Farm Family award for 2013 were announced. They are Dustin and Tammy White of Union County, Shane and Mary Courtney of Shelby County and Jonathan and Jessica Gaskins of Adair County. The state winners of these programs will compete nationally at the AFBF annual meeting in January. The Discussion Meet winner gets a choice of a 2014 Chevrolet Silverado or 2014 GMC Sierra. Three finalists receive a Case IH Farmall 55A and a $2,500 cash prize and $500 in STIHL merchandise. The same prizes apply for the Achievement Award winner and finalists, except the three finalists receive a Farmall 65A model. GM, Farmall and STIHL have been dedicated sponsors of these programs, as well as the “Excellence in Agriculture” awards for young farmers. Find more photos from the Young Farmer Summer Tour on Flickr. Find out more about our Young Farmer Program from our website and Facebook.